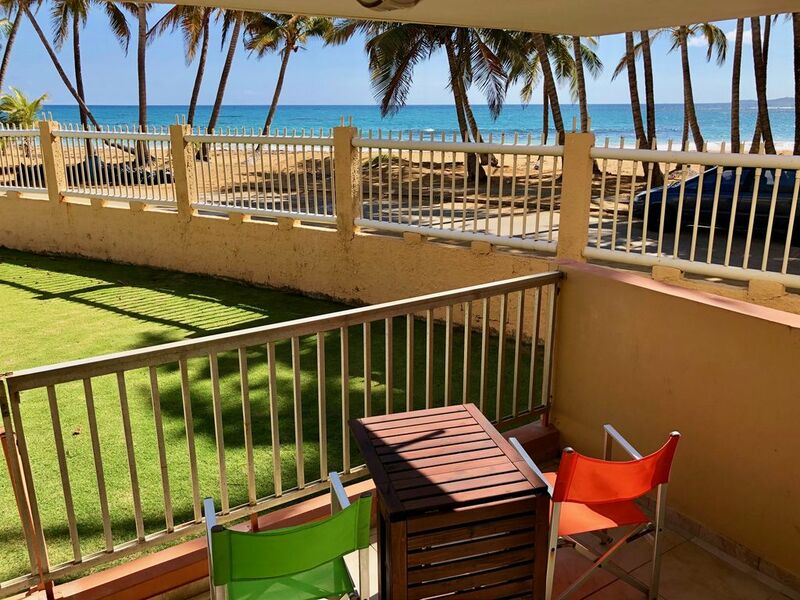 Beachfront ground floor condo in a gated complex with recent updates, located right on one of the best beaches in Puerto Rico. This condo is the closest one in the complex to the beach with spectacular views of swaying palm trees to the backdrop of the beautiful aqua blue Caribbean Sea. So close to the ocean, you'll fall asleep and wake up to the sound of ocean surf. The condo has all the conveniences of home with a 55" TV, reclining sofa, living room AC, fully equipped kitchen, washer and dryer, bath and beach towels, and dedicated high speed internet with strong WiFi from every room. Each of the two bedrooms has a queen sized bed, bedroom furniture, closet and A/C unit. The patio has a panoramic view of the beach and a few steps away from the swimming pool. The Playa Azul beach here has powder soft sand, gentle to moderate waves, clear water and is outstanding for spending lazy afternoons under coconut trees and swimming in tropical warm waters. The atmosphere here tends to be quiet on weekdays and festive on weekend afternoons and holidays. Only 40 minutes from the San Juan airport, Luquillo is conveniently and centrally located to some of the best activities Puerto Rico offers, such as Old San Juan, the bioluminescent bay, El Yunque Tropical Rain Forrest, San Juan Cerveza natural reserve and lighthouse, ferry to Culebra and Vieques islands, zip lines and more. We had a wonderful time during our stay. The apartment was equipped with everything we needed, everything was nice and clean. The rooms were comfortable, all was just as described! Before we arrived i was contacted by Omar the property manager who received us just as we got there, he was really helpful with everthing! Would definitely stay there again! My daughters did not want to leave! Thank you Roger and Virginia for the great time we had at your place, also Omar for his attention!! Alana is the best property manager !!! One the first day we could not locate a cooler. No problem .... Alana went to the store ,bought us a cooler, and delivered it to the condo. She was always responsive and extremely helpful as we were 1st timers to Puerto Rico. The condo itself was exactly as described, clean, and comfortable. Alana made the check in and check out process quick and easy. Since our weather was not the best , we plan to return and stay in this condo again. This was my first time booking through VRBO and they met all my expectations. The condo was lovely with plenty of room for the 2 of us. We had a beautiful view of the beach and easy access right to the pool. Since it wasn't peak season the complex was very quiet and we had the pool to ourselves almost the entire week. All the appliances including the air conditioning were in good working condition. Excellent water pressure and we always had hot water. I would highly recommend driving a short distance to the Kiosks for a tasty variety of food and nightlife. Alana was just wonderful, very professional and always kept me updated throughout the entire process from booking the trip to arriving at the front door of the condo. This place is a gem and can't wait to return!! We had a friends place in Fajardo booked and when we arrived it was not ready! We quickly went to VRBO and begun calling properties to see if by any luck we could find something nearby. We called the manager of this condo her name is Alana and she was professional and quickly sent us the link for payment. I was a bit afraid considering the past review but I had no choice. The apartment was fantastic! It was right in front of Luquillo beach was a pretty little patio to enjoy my coffee in the morning. You can hear the waves crashing while sitting on the sofa. Living room had a huge TV with media sofas that auto recline....Nice. The kitchen has everything you need save money from dining out so I made breakfast every morning. Master bedroom was small but the bed was super comfortable and has it's own TV and wall AC unit. Having a master bath was great. It was cute with a ceramic tile stand up shower that fit myself or my husband 5'8" just fine. 2nd bdrm was larger with a queen bed that my guest said was also comfortable. The condo came with a washer/dryer which I did not use but I am sure it comes in handy. There were also beach chairs and cooler which I used everyday. The linen closet was packed with fluffy white towels so we never ran out. Oh the condo is right next to a big pool but I enjoyed the beach too much for that. Private parking behind a gated lot was perfect and safe. I found this apartment to be in a great location and it was super cute and would definitely rent it again. Alana the manager was very nice and handed us a sparkling clean unit and that goes a long way with me. For the price (tax and cleaning fee included), this condo is way overpriced due to the condo's location and the overall complex (not luxurious at all). It seems like a place for local renters as well as we happened to be there during the holidays and it was quite noisy with all the parties and people next door. The pictures on the websites give an illusion that this place is spacious and new, but it is anything but that. We're a family of 2 adults and 2 children age 8 and 10 and we felt very claustrophobic. The two bedrooms and the bathrooms are tiny, especially the master bedroom. There's no place for our small luggage. While the bedroom furniture appear to be new, the sheets however are polyester. Oh my, polyester sheets in the hot weather. Please change the sheets to cotton sheets for future guests. There're only 2 air conditioners in the 2 bedrooms and in our opinion, they're not enough despite the breeze. When we arrived, the outside walls were just been patched up and had not been repainted. It looked patchy we did not want to open the doors to the porch...to look at the ugly walls??? And the master bathroom, I am 5'3" and I could not move in the shower so imagine if you're 6' tall. The second bedroom has shelves that have not been painted. As for the kitchen, despite the appearance that it's just been recently renovated, the cabinetry is old. The refrigerator has an odor and could use some cleaning and deodorant. Overall, we're very disappointed in the condo. The layout makes it very tight and not spacious and lacks adequate air conditioning. We are sorry that you were not happy with your stay. This condo is not listed as a luxurious condo. Your stay was during Easter weekend and in the description, it states that the area is festive on the weekends. If I had been contacted, I could have talked to the people next door to tone the noise down if it was after quiet hours. The room pictures were taken in panoramic view to show the full room, not to create an illusion of a bigger room. However, since this affected your expectations, we are replacing them with pictures taken with a normal view. The air conditioners are the correct Btu’s for the room size as long as the windows and doors are closed per instructions at check in. Due to the rainy weather and being holy week, the painting was not able to be completed. The kitchen cabinets were refaced per the description and in excellent shape and all doors and drawers in working order. As when I was cleaning and setting the condo for your arrival, I did not notice any odor. This should have been reported and it would have been corrected. El Yunque National Forest with a total area is 28,000 acres has an estimated 240 types of tree, and many other plants, such as tiny wild orchids, bamboo trees, giant ferns, and trumpet trees. Hiking trails and rest areas available. El Portal Tropical Forest Center has film exhibits and interactive displays about the rain forest. Open daily 7:30am a 6:00pm. Eclectic group of over 60 restaurants and shops. The buildings are humble but inside you will find great food, friendly servers and good prices. A "must see" when staying in Luquillo.